I love the Third District Court of Appeal’s recent ruling in a discovery dispute in Kobi Karp Architecture & Interior Design, Inc. v. Charms 63 Noble, LLC, 40 Fla. L. Weekly D1428a (Fla.3d DCA 2015), because its focuses on irrelevant discovery in a construction dispute. In this case, an architect entered into a contract to perform construction administration services. The contract included certain basic services (covered by the lump sum amount) and certain optional additional services (that would result in additional compensation to the architect). One such optional additional service was the architect’s responsibility to prepare as-built plans. After construction, the City of Miami required the owner to submit as-built plans since the completed construction deviated from the permitted plans. (This is a common occurrence as the completed construction rarely corresponds exactly with the permitted plans.) The owner wanted the architect to prepare the as-built plans for free. The architect refused since preparing as-built plans was an optional additional service entitling the architect to additional compensation. Oddly, instead of the owner working with the architect on a price for this additional service, the owner sued the architect for breach of contract for failing to prepare the as-built plans as a basic service. The owner decided to subpoena for documents six of the architect’s clients (other owners on unrelated construction projects) for numerous documentation including contracts and communications. The owner wanted to establish that it was the architect’s custom and usage to prepare as-built plans as a basic service with other owners. (What?!?) Despite objections and a motion for protective order from the architect, the trial court allowed the owner to move forward and subpoena these non-party owners for documents. The architect moved for a writ of certiorari arguing that the court order allowing the owner to pursue this discovery departs from essential requirements of the law resulting in material irreparable injury that cannot be remedied on an appeal at the conclusion of the case. The Third District agreed with the architect and quashed the trial court’s order allowing this discovery to take place. This appears to absolutely be the right ruling from my perspective. An architect’s contract or documents with any other owner on unrelated projects have no bearing on the contract at-issue. These other agreements or documents do not dictate what an architect agreed to do as a basic service for the instant project. They are irrelevant. What a party bargains for on one project may likely be different than what that party bargains for on another project (hence, the definition of a negotiated contract). 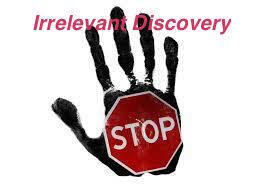 Although a party in litigation can pursue discovery reasonably calculated to lead to the discovery of admissible evidence (a very liberal standard), this does not mean a party has carte blanche to pursue completely irrelevant discovery or use discovery as a sword to harass another party. Here, the owner requiring the architect’s clients on unrelated projects to produce voluminous documentation would result in irreparable material injury. The Third District held that it was at a loss to see how documents from the architect’s other clients could ever be relevant (or reasonably calculated to lead to the discovery of admissible evidence) in this instant dispute. One of the reasons I like this ruling is because there are times a party in a construction dispute seeks discovery on unrelated projects that have no bearing on the construction project in dispute. Oftentimes, this is done simply because the party pursuing the discovery knows it will be an aggravation to its opponent to produce this documentation. But, besides the aggravation, what occurs on one project typically has no significance except to that particular project. A contract for one project, and what occurs on that project, has no significance to any other project (especially a project for a different owner). This entry was posted in Discovery and tagged irrelevant discovery, motion for protective order, reasonably calculated to lead to discovery, relevant discovery, writ of certiorari by David Adelstein. Bookmark the permalink.